At the end of July I had the chance to shoot the most detailed milky way nightscape photo I've ever taken. Ever since making a similar photo in Utah, I've wanted to repeat it, but finding the right location, the right weather, at the right time isn't easy. After a stunning sunset over Bighorn Canyon National Recreation Area, the clouds cleared out and the conditions began to come together. This image is a combination of 3 separate pictures, totaling nearly 1 hour of exposure time. First I placed my tripod on the edge of the canyon, then aligned my star tracking mount on Polaris (the north star), and then shot two 18-minute exposures of the milky way. Then I turned the tracking mount off, and shot a similar exposure of just the canyon, and later stitched the 3 shots together. Without a tracking mount, I'm normally limited to 30-second exposures before the stars start to blur. 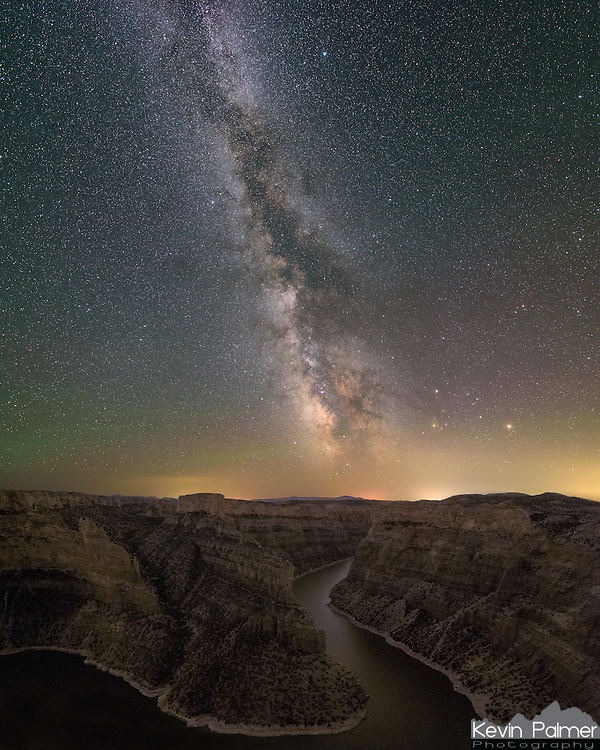 In addition to the milky way, the planets Saturn and Mars, and traces of green airglow are also visible. The light pollution along the horizon is from the towns of Lovell and Powell. While I was shooting this, bats kept fluttering around my head, eating all the gnats gathered around the puddles after a recent rain.